My final words to the youth group. 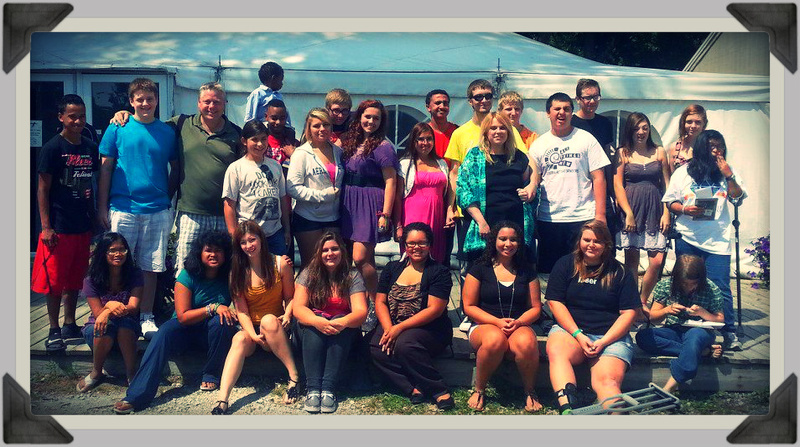 Editor’s note: Today, Sunday Aug. 11, 2013, was my last Sunday as the youth leader at Crossroads of Faith United Methodist Church. Below is the letter I read to the youth for our final youth group. I feel the need to start by telling you that I love you so much. I know. I know. I tell you guys that all the time. I’m always blabbering on about how I love every single one of you. How I pray for all of you, all the time. How I love you all individually. But the reason I say it all the time is because it’s true. It’s so, so true. I love you all. Every single one of you. I also want to tell you that I hate that I have to leave. I really, really hate it. I ask God all the time, why he’s taking something I love so very much away from me. And sometimes, I question whether God is even there to hear my question. I tell you that for two reasons. One, so that you’ll know I seriously tried every single thing in my power to stay in this role. Seriously. I feel like I clawed at the edge of cliff, until, finally, my hand slipped off and I couldn’t hold on any longer. The other reason I tell you that is so you’ll know that as you go through life, horrible, unexpected things will happen to you, and they will make you question your faith. They will make you question your beliefs. And they will make you question the very God you pray to. And that’s OK. The questions are good. They are normal and healthy and as long as you keep asking them, everything is alright. It’s when you stop asking questions that you should be worried. Because it means you’ve given up. Don’t give up. Also, don’t be afraid to fail. Imagine how many things you could do today, if you’re weren’t afraid to fail? You could ask that hot guy on a date. You could write a poem. You could make a YouTube video. You could write a song. You could start a band. Now project that out into your life. There are so many things we stop ourselves from doing every single day because that little voice in our heads tells us that we might not be good enough, or we might not finish it, or we might not do it better than the other guy. But that voice is stupid. Do it anyway. Chances are you probably won’t fail, and even if you do, it won’t be nearly as bad you think it will be. Also, you will have succeeded more than if you had never tried at all. Have a plan for your life. You don’t have to stick to it, but you do need to have it. It will help you keep your priorities in order. It will help you make huge life choices. And it will help you get to the next step. I started out wanting to be a teacher, so I went to college. Than, I thought maybe I could try the writing thing, so I started working for the school paper. Then, I ended up being pretty good at it, and now I work for a candy magazine. I never became a schoolteacher, but imagine if I had never taken the first step to go to college? Know which rules to keep and which ones to break. Maybe you need to miss a week of school to go to Europe. Do that. Maybe you need to finish all your homework so you can graduate. Do that. Maybe you need to play a clip of Zach singing “I like Big Butts and I cannot lie” in the mission trip video, for the whole church to see. Do that. Maybe you need to wear your yellow Mission trip shirt when everyone else does, so that everyone matches, and it looks awesome. Do that. Serve others every chance you get, whether it’s opening the door for your mom, or painting a house on a mission trip. Go on every mission trip you’re invited to go on. I promise it’s always more important than whatever else you have going on. Read the Bible. Every day. Never text and drive. Never drink and drive. Always keep at least a car length of space between you and the car in front of you when you’re in heavy traffic. Don’t check your phone when you’re on a date. Go to church every week. Even if you don’t feel like it. Especially if you don’t feel like it. I confess that one of my biggest fears right now is that I will come back in six months and this entire youth group will be gone. I pray every night for that not to happen. Don’t let that happen. You are the group. No matter who comes in as the new youth leader, you are all the people who make up the youth group. Every single one of you. And as long as you keep showing up, you will all continue to have the wonderful place to come to every week to share your souls with each other. Take your hat off when you pray. Donate lots of money to lots of things. Give money to the church. Give money to the homeless man on the street. Give money to your mom. Give money to your friend. Give it away like you can’t take it with when you die, because you can’t. Never, ever, wear navy blue with black, or brown with black. Just trust me on this one. Buy the cheap gas, and the expensive deodorant. When you are old, remember what’s it like to be young. Remember how crazy this time is for you. How emotional it is. How scary the world seems. And have compassion for those who are younger than you. When you heart is broken, take the time to cry. Maybe you need five minutes, maybe you need five months. Either way, give your heart time to heal before you date again. It’ll make finding your next love much, much easier. And yes, there will be a next love. I promise. Start by forgiving your parents for all the stupid things they did to you. Then, forgive your best friend every time you have an argument, and your least favorite teacher when she gives you 10-page papers to write. Forgive the guy in traffic who cuts you off, and the boy who never calls you back, and the college that’s too stupid to accept you. And then take a deep breath, let it all go, and move on. I have gone through some extremely dark times these last few months, while I’ve been sick. And I’m not afraid to say that on some nights the pain was literally too much for me to handle. And I would think about things I shouldn’t have. And the only way I got through those nights was by picking up the phone and calling Eric or my mom or my friend Terri and having them answer at 3 a.m. and listen to me cry. I would not have made it through the last few months without the help of my friends and family. If you can ask for help, you can literally make it through anything. Live your whole life with passion. If someone asks you to lead a youth group, don’t just show up on Sunday morning. Instead, plan an out-of-state mission trip; start a night group and then personally ask every single kid, every single week if they’re coming to that night group; decorate the room with the kids’ hand prints; serve pizza and Taco Bell and McDonald’s, respond to every single one of their text messages immediately; and pray for them all individually all the time. Remember that you are always setting an example. People will do what you do. If you jump during the “Waves of Mercy” song, everyone else will too. If you are a hard worker, those around you will become hard workers too. If you care, everyone around you will start to care too.